GrowthForce provides U.S. subsidiaries of foreign corporations with a turnkey solution to bookkeeping, accounting and management reporting. Our extensive experience with parent companies on every continent (besides Antarctica!) allows you to get set up quickly and ensure compliance with all U.S. Federal and State regulations. Our processes and procedures meet GAAP requirements and we provide customized reporting that helps drive profitability for the subsidiary while providing reliable financials for the foreign corp.
Our expertise in acting as the accounting department for the US Operations of International corporations eliminates the burden to the stateside team. This helps you to focus on sales and operations and penetrate the U.S. market. We'll unleash the advanced power of QuickBooks and deliver GAAP and IFRS compliant financial reports based on your reporting requirements. 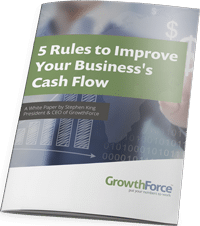 Whether you’re interested in growing, selling or simply maintaining your business, our five rules to improve cash flow will help your business achieve the financial agility and control you need to be successful.